You may have heard me talk about Twitter before, and I feel like I am addicted to the service. If you haven’t tried it out, it’s sort of like IM, but very more relaxed and casual. For those of you that love to talk and interact with people, Twitter is definitely for you. If you are more of an observer, and just like to listen and see what other people are talking about, Twitter is perfect for that as well. One of the ways many people use Twitter is to publish tweets about their latest blog entries. I do this myself. One of the benefits I have discovered is that it not only alerts people to my entries as soon as I post them (faster than RSS), but it also sparks conversations easier as you don’t have to use the comment forms. It’s like instant discussion. 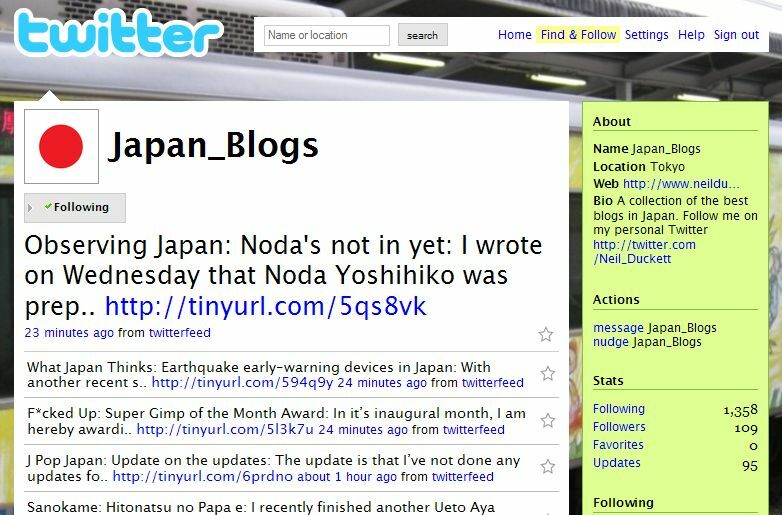 Neil Duckett has taken this concept a bit further and created a Twitter profile that tweets a lot of entries from the bigger Japan blogs across the blogosphere. So if you’re debating trying out Twitter, be sure to follow Japan_Blogs as well as myself!